Nancy Cramer, Shaw Cramer Gallery: Not necessarily. Vineyard House, a safe, sober place to live for Islanders in early recovery from substance abuse, invites the community to a potluck dinner and presentation at 6 pm on Thursday, June 3, at the Grange Hall in West Tisbury. The "Creating Possibilities" Resource Fair, held on Saturday, May 8, at the MVRHS was organized in hopes of providing easy access to resources that could be supportive to families that include family members with developmental disabilities. In the May 20 issue of The Times, the article "County budget shifts save little" incorrectly reports that most county employees will receive a 3. Edgartown has new faces, revamped stores, location changes, and even a store that moved back from another town. The only restaurant that isn't opening this weekend seems to be the new Wallace brothers venture, The Ocean Club, formerly Danny Quinn's Pub and Balance. This weekend the Vineyard Playhouse will play host to a couple of very talented and engaging female singer/songwriters, one — an import from Boston — on the forefront of the folk rock circuit and the other, an Island girl who is poised to make her mark on the scene with the release of a powerful debut CD. Gallic humor runs amok in French director Ilan Duran Cohen's 2008 comedy, "The Joy of Singing" ("Le Plaisir de Chanter"). There are 30 educational, informative, and interesting events and exhibits kicking off this summer at the Martha's Vineyard Museum. "Schooner: Building a Wooden Boat on Martha's Vineyard" by Tom Dunlop, photographs by Alison Shaw, Vineyard Stories, July 1, 2010. I would like to thank the Martha's Vineyard community for coming out in force for my fundraiser. The Capricorn House bed and breakfast on Seaview Avenue in Oak Bluffs has received a "Green Business" certification from the Institute for Green Business Certification Inc.
Vineyard Gardens, on State Road in West Tisbury, will again host a Saturday series of expert lectures on gardening topics, each beginning at 11 am. Adult and Community Education of Martha's Vineyard (ACE MV) recently completed it's first humanitarian travel/service project in Nicaragua. Vineyard Village at Home, now more than two years old, is looking for new volunteers and for more Island seniors who still live at home but need a helping hand. On the evening of May 6, Island gallery owners met on the sun-filled patio of Farm Neck Café to compare notes, share ideas, and partake of refreshments. The Steamship Authority (SSA) members have approved a set of rate policy guidelines, plus some rate reductions, in special instances that included reduced rates for Island residents who must travel frequently to the mainland for treatment of serious medical conditions. The Steamship Authority officially opened the new Oak Bluffs terminal yesterday with a ribbon-cutting ceremony. 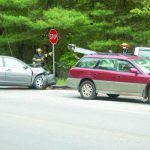 Two people were transported to Martha's Vineyard Hospital Wednesday afternoon, after a two-car accident at the State Road and Old County Road fork. Tisbury Water Works (TWW) announced a new rate structure for water service, effective in July.